Limnanthes douglassii is a small annual herb that is native to the west coast of North America. The plants are 1 foot tall and short lived. Blooming Time: Early Spring The 1 inch flowers are yellow with white tips and fragrant. Propagation: Limnanthes douglassii are easily propagated by seed with night temperatures of 50 degrees. 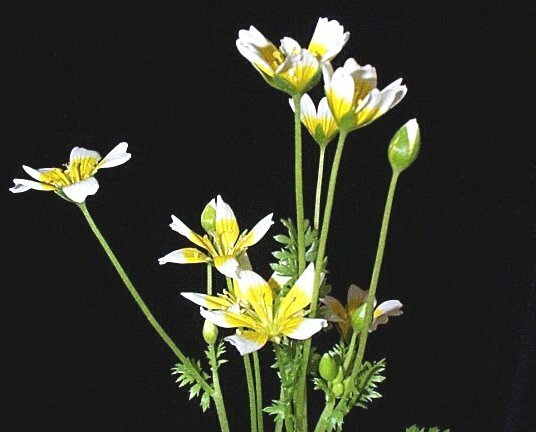 Limnanthes douglassii was featured as Plant of the Week June 9-15, 2000. These pages are provided as a service by the Department of Botany and Microbiology, University of Oklahoma by Cal Lemke.